How to stop a dog/pup from jumping? It is a common scene that dogs jump on the strangers while you are taking them for a stroll at the park or on road. Everybody is not a dog lover and may shout at you for your pooch’s behavior. However, this behavior can be intelligently tackled efficiently. Generally, when a cute fluffy puppy runs to us and jumps on our laps, we think that he loves us and is extremely happy to see us. But, this may not match with other people’s thinking. Especially, dogs tend to lick us. Many don’t like the fact. The problem becomes worse when the licking and jumping habit continues in adulthood. Imagine a Great Dane or a big-sized Golden Retriever comes running to you and jump straight on your lap and starts licking you covering your face, neck and hands with the saliva. We need to curb the jumping habit in the dog’s childhood that is when he is a little puppy. Even, a puppy can hurt himself while jumping as he can fall on the hard floor breaking a bone or risking the joints. Why do dogs jumps on you and other people? Usually, dogs/puppies greet us when they see us. They are very excited to have a glance at us for a long time. So, whenever you return home after office, they will welcome you by showing affection that is barking and jumping on you. Many dogs are not fond of jumping. If your puppy is of such breed and then one day, suddenly he jumps on you, be careful as he wants to make you alert of something. Little dogs/pups can get scared of loud noise, seeing big dogs or other animals, any stranger, etc. They can jump on you ( his owner) to get some protection. Remember, the furry companion speaks canine and you speak human. So, if he wants to work out certain things, he uses the body language that is jumping. Dogs are pack animals. They want to be the alpha or lead the pack and give protection. Here, you are his pack member and he is establishing dominance on you and if you fall in any danger, he will protect you. Hence, the jumping happens. A newly arrived pup is untrained and unconditioned. His social skills may be extremely poor for human society. The little puppy can jump on everyone, chew everything, run crazily and investigate everything comes in his way. Steps to train a dog not to jump? Train your puppy not to jump on everyone. Give him time, and balance the stress levels. You have to let him experience new things to become used to the humane things. Keep your eyes as the puppy can chew and ruin things and even hurt himself in the process. Correct the furry fellows. Be a guardian. Move them away from the person whenever they are trying to jump on that specific human. Do it in a calm manner. In this way, the pups will learn their boundaries. Train the pups to sit patiently when your guests arrive at your place. A dog follows the pack leader and his commands. Pick a command language and sign. Don’t change the cue. As a result, whenever they see you or your guest, they will go away and sit patiently. Become the boss. Dogs belong to a social group. They follow an alpha or the pack leader. Whenever they don’t have a clear pack leader, they try to fill the vacuum. They may try to establish themselves as the pack leaders. It’s the innate tendency. Hence, when you bring a pup in your home, be the pack leader yourself and lead the pooch. Too much affection is wrong. Loving your dog is one thing and showing extreme affection all the time is another thing. Treat your dog like a “dog.” No matter how much you see him as your own child, a dog is ultimately a “dog.” Be practical and sensible. Never shower your affection whenever you enter the door. He will take it as the permission followed by a jump on you. And will keep on doing it till he leaves the world. Keep it in your mind that leadership is permanent, at least throughout the dog’s life. If you are inconsistent regarding your leadership, it will confuse your puppy and generates anxiety in him. It will lead to hyper dog behavior which is jumping, barking, scratching, etc. Be the boss of your dog forever. Your pup can’t understand that he is spoiling things and occasion by jumping. The little dog may take a negative reaction of the humans as something very funny. You can distract your dog. You can ignore your dog whenever he is trying to jump on you. Proper and patient training will cure the jumping issue. 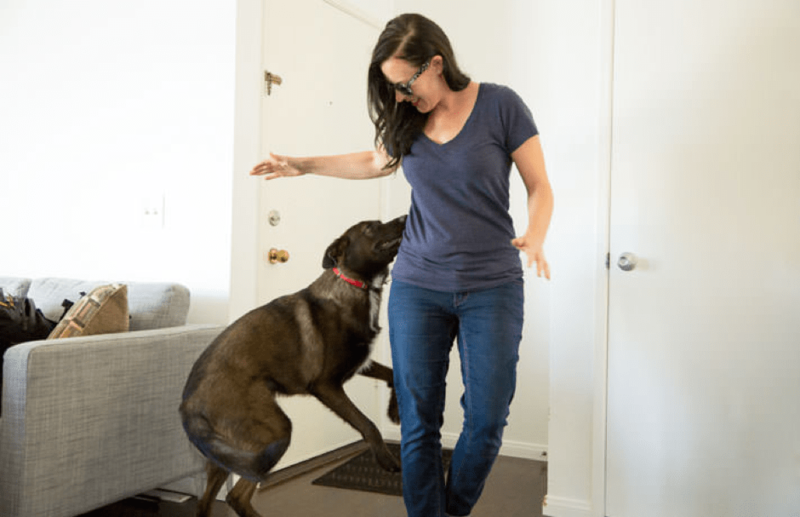 A dog behaviorist or trainer can definitely help you. Also, visit a veterinarian to check if your dog is healthy and happy.